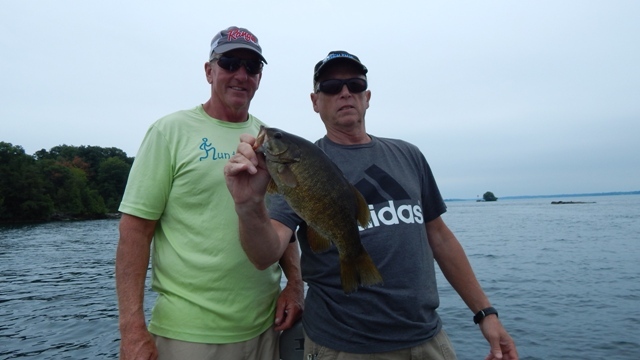 Fishing for smallmouth bass on the St. Lawrence River tops the fishing bucket list for many bass fishing anglers. The attraction of trophy smallies and the thrill of big river fishing both provide an unforgettable experience. I have been to the Clayton and Alexandria Bay areas in New York many times, but never fished the St. Lawrence River. Like many anglers, fishing for smallmouths on the St. Lawrence River has been something that I wanted to do for some time. Up until now I have only heard and read about the 5- to 6-pound smallmouth bass that were being caught on this great fishery. Enough waiting, I finally made the decision to head north and book a guided smallmouth bass fishing trip. 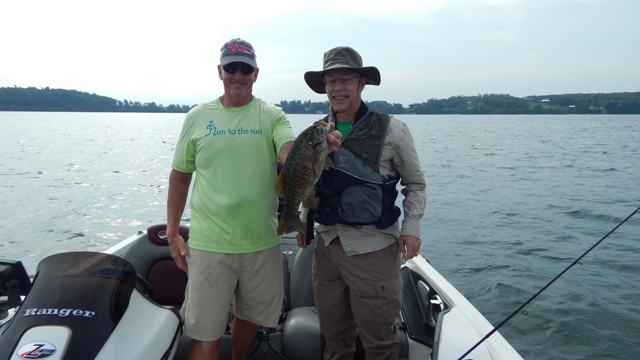 If you are going to put together a St. Lawrence fishing trip, it all starts with picking the best smallmouth bass fishing guide. Deciding to go with a guide has three advantages. First you do not need to educate yourself on the river. Knowing a river, both where to fish and how to get around, is a life-long task and better suited for a local fishing guide. Second, there is no need to stock up on new fishing gear. Most bass fishing guides will provide all the rods and reels, fishing lures and other equipment you may need. Just bring personal items like rain gear, sunglasses and anything else that you may need in a small “carry on” bag. Lastly, your success rate is dramatically increased. Fishing for smallmouth bass in an unknown river with no prior knowledge makes it almost impossible to be successful your first time out. Pairing with a bass fishing guide who spends much of the year on the water ensures you will be catching smallmouths. How do you find the right fishing guide? Nowadays the internet is the first place to look. I started by searching for fishing guides for smallmouths on the St. Lawrence. After scrolling through many websites and reading countless reviews, I landed on Dean Meckes Charters. Dean Meckes Charters is run by Dean Meckes who is based out of Clayton, NY. Dean has over 25 years of experience on the river and is a great fishing guide. He knows the St. Lawrence and can put you on fish, big fish. After all the research, I booked Dean Meckes Charters. I got up to Clayton, New York the night before our fishing trip to settle in and enjoy the wonderful area. The next morning, we met Dean at the boat ramp with high anticipation of landing some monster smallies. When you first met Dean, you can tell right away that he has a passion for life, fishing and the St. Lawrence River. I felt very comfortable in the boat with Dean, and it was like I knew him for years. Dean’s experience goes back to fishing many professional tournaments with over a dozen top 5 finishes, and he has also qualified for the B.A.S.S. Elite Series. The rig we fished out of was a 20-foot Ranger Bass Boat with a 225-HP Yamaha Motor matched with all the state of the art electronics to put you on fish. The weather kept us on our toes with some strong winds here and there, but overall what an experience. I had a great day on “The River” and caught some really nice smallies under the direction and experience of Dean. A few of our catches are captured below. ?Once you experience this River, you are hooked. 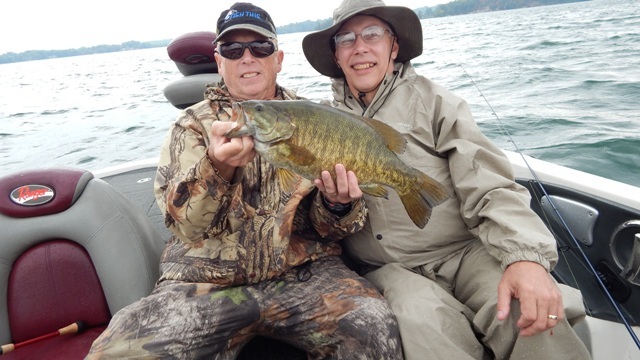 Fishing for smallmouths on the St. Lawrence River is a place that every bass fishing angler needs to experience. I am definitely going back, and it will be with Dean and Dean Meckes Charters. 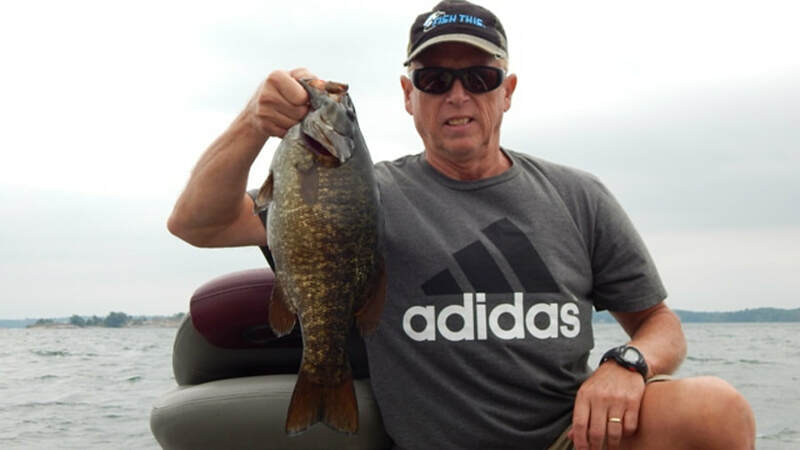 To contact Dean and book your St. Lawrence smallmouth bass fishing experience, visit his website at deanmeckes.com or by calling him at (315) 405-1706. This entry was posted in 1000 Islands and Lake Ontario Fishing Guide Information by admin. Bookmark the permalink.